on veterans day, i was the writing assignment, the live in-class lesson on poetry for 8th graders at stoddert middle school in temple hills, md. 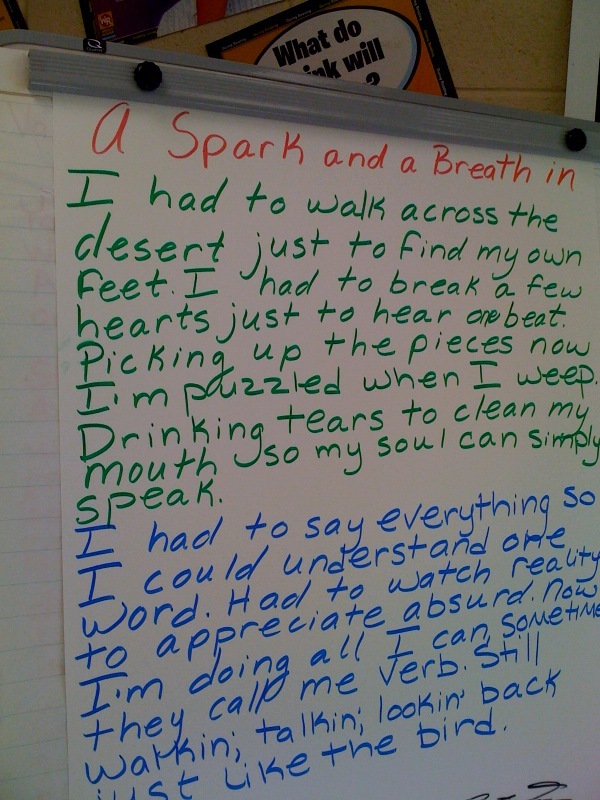 here is part of my poem written up to be dissected by the students. we were working on making inferences using our background knowledge and text clues. the day before, on wednesday, i brought my friend marie elaine to speak to and perform for some of the high school students i work with on hiv/aids awareness and prevention. i taught them the baltimore tradition of pen throwing, and you can see marie elaine clearly earned her share of pen moments. and i think a hat and a shoe at one point too. she is amazing. and her poetry book from 2 pens and lint just came out. i got my copy. get yours! you can get my book too, if you haven’t yet. I’m glad you had Marie Elaine through. Her personal story is amazing when considering the fact she’s pushing through it and choosing to uplift others by showing them they’re not alone. That’s really important for all of us but especially teenagers.